We have a two week timetable, each week consists of one 60 minute lesson and four periods of 65 minute lessons every day making 25 periods in one week. There is a form period of 15 minutes at the beginning of each morning. 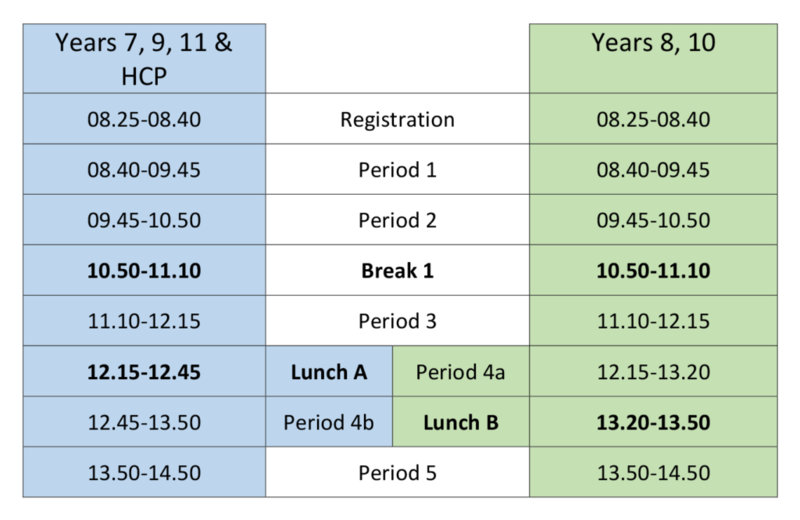 In addition to this some post 16 lessons are timetables in additional twilight sessions. The table shows how a typical day is divided to include breaks and a split lunch. Students will be allocated lunch according to their year group. School starts at 8:25 am and finishes at 2:50 pm. As part of our vision of pursuing excellence, we strongly believe in offering a broad, balanced and inclusive curriculum, which caters for our students’ needs. It supports them in fulfilling their ambitions, whilst also fostering a love of learning, the skills to be successful and an understanding of how they can be healthy, safe and well-rounded citizens. This successful curriculum approach is underpinned by high quality teaching and an emphasis on fostering positive learning behaviours from students. At Temple Moor we run a three year foundation phase to develop students’ understanding and skills in readiness for beginning their GCSE courses. Our KS3 curriculum allows students the opportunity to study English, Maths, Science, a Modern Foreign Language, History, Geography, Art, Technology, Performance and PSHE/Citizenship. Students also study Leadership through PE, which promotes learning and leadership skills through sport, and Communication. Students study the full range of Technology and Performance subjects in Year 7, but begin to specialise in Year 8 by choosing subjects within these two areas which most interest them and suit their individual skills and personal aspirations. In Year 9, students specialise further in their chosen areas with Technology and Performance, and select one option choice with which to begin their KS4 studies. Some students may also be offered the opportunity to begin Triple Science. However, all students maintain the breadth of subjects they undertake up until the end of Year 9. Year 10 and 11 follow the core subjects of English Language and English Literature, Maths, Combined Science (or Biology, Chemistry and Physics for those studying Triple Science) and PE, complemented by three further options choices in which they specialise. We offer a diverse range of GCSE and Technical Award qualifications from which students are able to choose. Our curriculum also includes a wide and varied extra-curricular offer through the extensive number of clubs, sports teams and performances that our staff offer throughout the year. All students are actively encouraged to participate in one of these extracurricular clubs each week after school, as a way of fostering relationships, health, skills and broader interests. A selection of the clubs on offer are: Cooking Club, Coding Club, Rowing Club, Rugby, Chess Club, Enterprise and STEM. We also use home learning as a means of consolidating and extending the learning which occurs within the classroom, which we encourage parents/carers to discuss and support students in completing. Following a Curriculum Review in 2017 the school has returned to a three year foundation phase. The curriculum for all year groups and abilities is broad, balanced and challenging, encompassing a variety of academic subjects and practical based subjects to prepare students fully and ensure that they have the knowledge and skills they need to be successful and to progress. Students who join us in Year 7 who have yet to achieve ‘Secondary Ready’ follow an adapted curriculum model, where they have additional hours of English Literacy, rather than studying French. Our Foundation Phase also includes designated time aimed at developing students’ Communication and Leadership skills, alongside all the Core and Foundation subjects. In Year 8 students also have the opportunity to choose a selection of Foundation subjects to specialise in, ahead of the options process in Year 9. Students also have the opportunity to choose one Level 2 qualification which they will study in Years 9 and 10, together with continuing to study two of the foundations subjects. The options selected by students at the end of Year 9 begin in Year 10. The Key Stage 4 curriculum ensures that all subjects have an allocation of time required to prepare students for the linear examinations. It is anticipated that over 45% of Year 11 in 2019 – 2020 will complete the EBACC qualification and the vast majority of the year group will study either History or Geography. Current Year 10 and Year 11 follow the previous curriculum models. 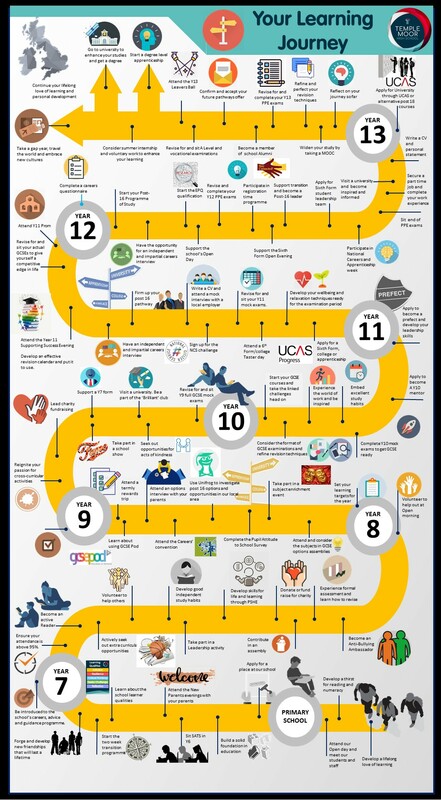 Our Post 16 curriculum is designed to meet the needs of our learners wishing to follow Level 3 courses, it provides progression routes building on the successes achieved at Key Stage 4, as well introducing new subjects. Our offer includes 37 subjects, a combination of both Academic A-Level, Applied General and Tech Level courses. We are able to offer many different subject combinations thanks, in part, to a long standing partnership arrangement that we operate with Brigshaw High School. The partnership enables us to put on courses that would only naturally attract small numbers of students if they were offered by each individual centre. By drawing together these small numbers, we can create larger groups and therefore satisfy more students, allowing us to offer a wide and varied curriculum.